Whether you are running your webinar as a PowerPoint presentation, or showing your face on camera, there are 5 must-have tools you need to run a successful webinar business. 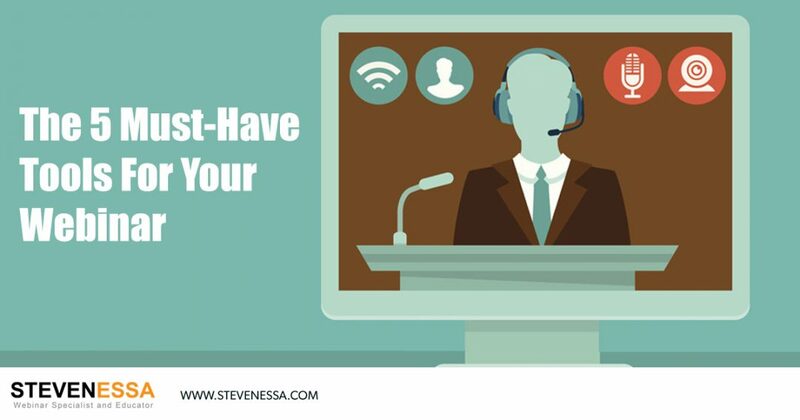 To run a live webinar, you’ll need to get an app or software dedicated to webinars. There are many different platforms out there, but the most common ones are GoToWebinar and Zoom. They both do similar things and are very reliable and easy to use. Having dedicated webinar software enables you to be able to present to hundreds (even thousands!) of people in your target market all over the world. The software will also record your webinar so you can send it out as a replay later for those who registered but didn’t attend (we call them ‘no shows’). Or you can just send the replay out to everybody. Either way, you have that option. You can also keep the audience engaged by running a Q&A session (Question & Answer) which is very popular with live webinars, and this can also help generate more sales as you’re building further rapport with people and answering potential sale objections they may have. At the end of the day, whichever webinar software you choose, just make sure it’s reliable and user-friendly. That’s why we recommend GoToWebinar or Zoom. Not everyone wants to run their webinar live, so another way you can deliver your webinar is by purchasing ‘screen capturing software’ such as ScreenFlow (for Mac only) and Camtasia (both PC & Mac). These cost-effective software’s will record anything on your computer screen, capturing both the audio and visual at the same time. You can then edit out any unwanted errors, fix fluctuating volume levels, and export in many different types of formats. And that’s just the beginning… it’s almost like having a small movie studio at your fingertips! You can also use ScreenFlow or Camtasia to edit your YouTube or Facebook/Instagram Live videos. Simply drag the recorded file into your screen capturing software and you’re ready to start editing! It really is that simple. And it also comes in handy for podcasts. If podcasting is something you’re thinking about doing, then ScreenFlow or Camtasia will certainly work well for you also. There are many benefits when it comes to screen capturing software such as ScreenFlow and Camtasia, and doing pre-recorded webinars is just one of those benefits. If you’re on a Mac computer, get ScreenFlow. If you’re a PC user, go with Camtasia. You’re going to have a lot of fun with it! Some of the tasks email marketing software will handle include broadcast emails, newsletters, auto-responders, database management, and list automation. Some even have CRM (Customer Relationship Management) capabilities as well. Something like MailChimp will get you started for free, but once you get into more advanced marketing campaigns, you will have to invest in more sophisticated tools. They all have a free trial period, so it’s a good idea to try them out and see which one works best for you and your business. If you’re going to be promoting your webinar via email (which I highly recommend you do as it has the best success rate) then you’re going to need email marketing software. Webinator is a platform that we developed which allows you to automate any webinar in just a few clicks, allowing you to make sales without you ever having to always be presenting your webinar live. It has all of the features you need to run hundreds of webinars simultaneously with unlimited attendees. This is the perfect tool for those who don’t want to run live webinars and just pre-record them. Even if you are running live webinars, this will then automate them for you. Webinator makes it easy for you to record, edit, store, and replay webinars so that people can watch them whenever they want. It allows you to have automated webinars online and making you sales without you ever having to be there. Plus, unlike other webinar automation tools currently available, it is very user-friendly. One of the most important tools to have in your webinar business arsenal is Leadpages. To help build your database of names and email addresses, you will need to have landing pages (also known as lead pages, opt-in pages, squeeze pages, registration pages, lead magnets, etc) that will capture those leads and send them to your email marketing software i.e. AWeber or GetResponse. Leadpages have been what you might call the ‘industry standard’ in this area for many years now, but there are other software’s out there such as ClickFunnels and OptimizePress that will do the job just as effectively. What’s great about Leadpages is that it provides you with a countless number of ready-made templates to help get you up and running quickly. Or, you can build your own landing pages using the Drag & Drop Builder feature, which I highly recommend. Leadpages will integrate with most internet marketing softwares out there today, including GoToWebinar, and all of the above email marketing softwares mentioned earlier. In other words, it allows you to create landing pages for people to register to your webinar and simultaneously adds the leads collected to your email marketing software. You won’t be able to run your webinar business without something like Leadpages, which is why it is in my 5 must-have tools. So there you have it, with these 5 tools, you’ll be able to hit the ground running with your webinar business! THis was awesome! I was overwhelmed with the many tools and which to start first and not to duplicate efforts! This was simple concise and a great way to coordinate each step. I have been conducting webinars for other companies for 3 years and I am going to try to use my free webinars to drive more clients. If it is successful, I may try to offer webinars at a sales price. Thank you for making it clearer! Thanks, Stevie you’re a wonder! Hi Steve, your webinar training is awesome. Thoroughly enjoyed every minute of it.